Iran’s vast size and large climatic contrasts with its different geophysical conditions provides the ecological context which has made possible the growth of a wide ranges of flora. The systematic study of this flora has its own particular excitement and challenge. Ancient Iranian scholar had not only achieved considerable recognition of the various plant of their land hut had also been able to introduce a number of them in to other parts of the world. Modern scientific study of botany including description of plant species in this area began in 19th century at first by the efforts of many forcing plant collectors and investigators and then it was at 20th century that some Iranian scholar started to contribute on the flora of their country. 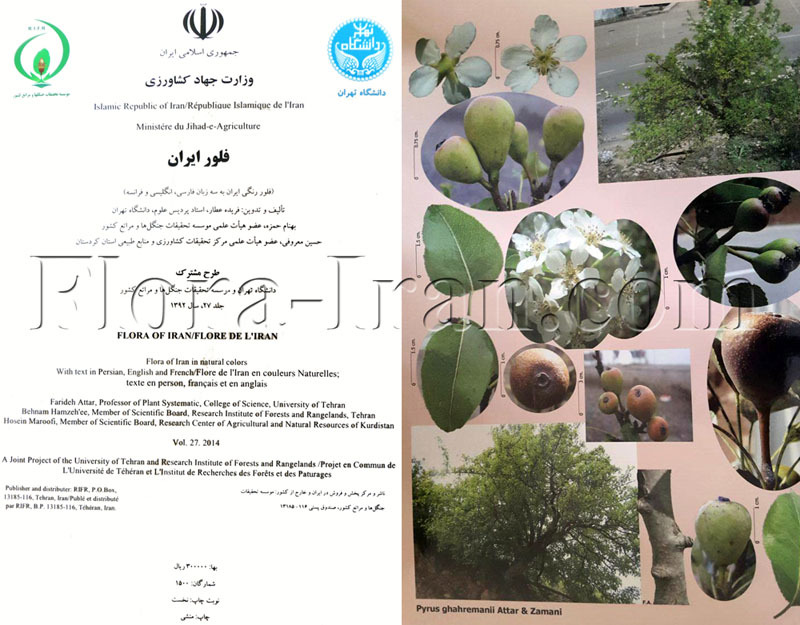 Serious interest in botanical studies particarly in the investigation of the Iranian flora was greatly fostered by Prof. Dr. Ahmad Parsa, the first professor of botany at Tehran University. Parsa and some of his students collected plant specimens in different parts of the country. He started to study flora of Iran since 1933, during 1945-1958 as a founder and leader of the Natural History Museum of Tehran. He established a herbarium as part of this museum and the materials of this herbarium were helpful to him in the compilation of his Flore de l’Iran (in 5 volumes plus 5 supplements, Tehran 1945-1959), where he authorized many new species for the country. This outstanding and very valuable work is the first independent comprehensive reference on the Iranian flora. The publication of an English revised version of this work by the author and his colleage Dr. Zeinalabedin Maleki is in progress. (Tehran 1978-). An important part in the furtherance of botanical exploration in Iran is also due to Dr. Erwin Gauba (Austrian botanist), during nine years of his service (1933 – 1942) as professor of botany in the Higher School of Agriculture and Rural Craft. He devoted himself to collecting plant specimens from Karaj and some other parts of Iran usually in company with his Iranian assistant Dr. Esfandiar Esfandiari and his students, studing these collected materials. He enjoyed the scientific cooperation of the famous botanist Joseph Born Muller. An enduring interest in exploring the flora of the country is developed in a considerable number of the students and successors of Parsa and Gauba. Indeed in the past forty years have made several excursions to very remote regions of Iran and the collecting activities are increased by them which resulted much larger collections; and in recent decades Iranian scientists have made some important contributions on their country’s flora. Despite the intensive plant collecting activities and the meritorious efforts of investigators, the knowledge in the flora of Iran is by no means complete. This is due to the tremendous topographic diversity and the great evolutionary potential of the area which lead to the creation of large number of endemic plant species and result the fact that numerous plant taxa have their centres of diversity in this region. Some plant genera are very difficult to treat taxonomically especially those common plants that constitute typical semi desert and steppe vegetation. They are often very rich in species and give rise to problems that have not yet been resolved. Therefore much more remains to be done for completing flora of the country. The establishment of Central Herbarium located at Tehran University, Faculty of Science (TUH) is very important for rapidly developing botanical researches in Iran. During past 7 years many internationally known Iranian scholar , scientists and botanists connected with other botanical research institutions are cooperating with this center. They play an inestimable part in the furtherance of botanical activities such as identification of the specimens sended to this herbarium from all over the country; and in order to act as a center of in formations and document ions. Central Herbarium is arranging some organisations and preparing the necessary equipments for achievement of all botanical needs of the areas.